Q: I am used to hearing the term “centrifugal” pump, but sometimes hear them referred to as “rotodynamic” pumps. Can these terms be used synonymously? A: Rotodynamic pumps are kinetic machines in which energy is continuously imparted to the pumped fluid by means of a rotating impeller, propeller or rotor. These pumps transfer mechanical energy to the fluid primarily by increasing the fluid kinetic energy. Kinetic energy is then converted into potential energy (pressure) in the discharge collector. The most common types of rotodynamic pumps are radial (centrifugal), mixed flow and axial flow (propeller) pumps, including pumps historically referred to as vertical turbine pumps. 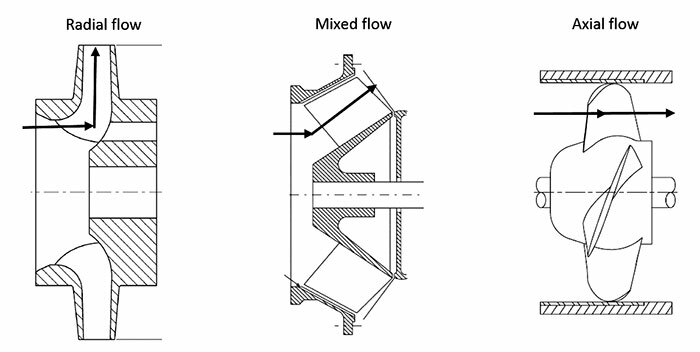 Radial, mixed and axial flow impellers are shown in Image 1. As seen from the definition of a rotodynamic pump and Image 1, it is a term used to describe a larger group of pumps that includes centrifugal (radial flow) pumps, but also includes mixed and axial flow pumps and some other unique constructions. Centrifugal pumps are the most common type and the term is synonymous with radial flow impellers where the flow enters the impeller in line with the pump shaft, but discharges the impeller perpendicular to the pump shaft. Rotodynamic pump types are also commonly described by their general mechanical configuration as described in Image 2. To answer the question directly, a centrifugal pump is a type rotodynamic pump, and not all rotodynamic pumps are centrifugal pumps. For more information, refer to ANSI/HI 14.1-14.2 rotodynamic pumps for nomenclature and definitions, and ANSI/HI 14.3 rotodynamic pumps for design and application at www.pumps.org.